Our home improvements have been progressing at a turtle-like pace ever since football season started, which is to be expected. (The hubs is a football coach and works long hours this time of year.) 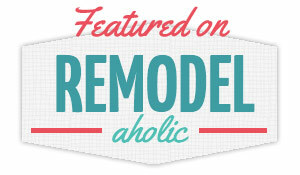 Combine that with a mild case of home improvement ADD, and you get what we have right now: several different projects that are started but not finished. Sigh. 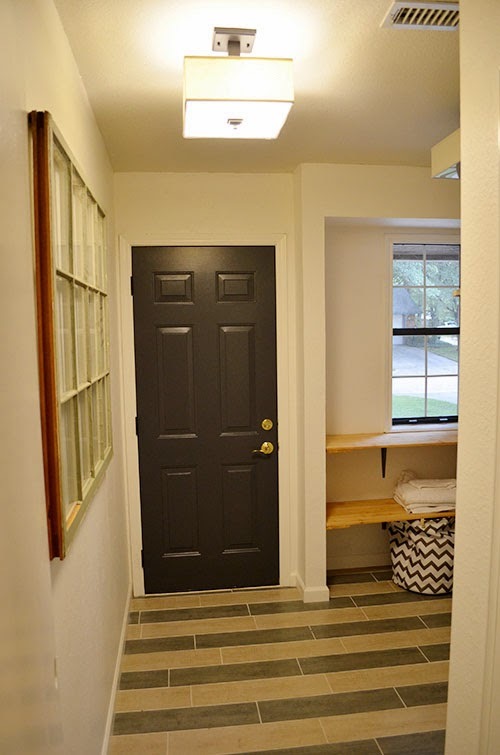 I thought I'd pop in today to show you the progress we've been making on two ongoing projects, the laundry room makeover and the custom wardrobe closet for the master bedroom. That white tile was the bane of my existence. This is our main entrance to and from the house, so that white tile was constantly dirty. We laid down some fun tile in a striped pattern and painted the walls white, which instantly improved everything. 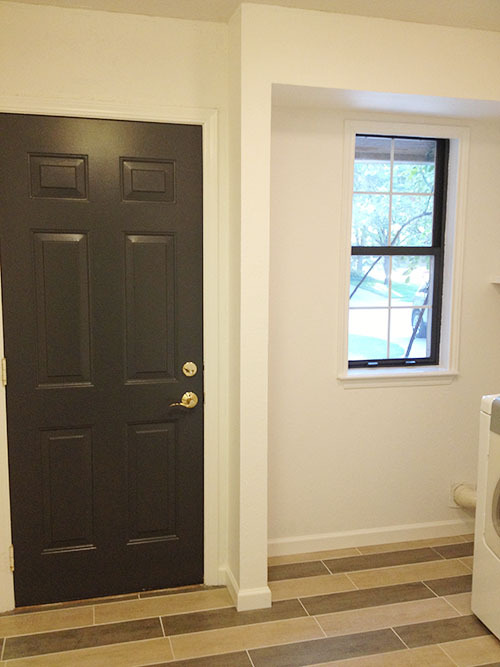 We also painted the door and the inside of the window a deep grey and installed new baseboards. Did I mention what a pain it was to paint the trim and doors white? (This room has two other doors besides the one in this photo.) Oh, it was a BIG pain! 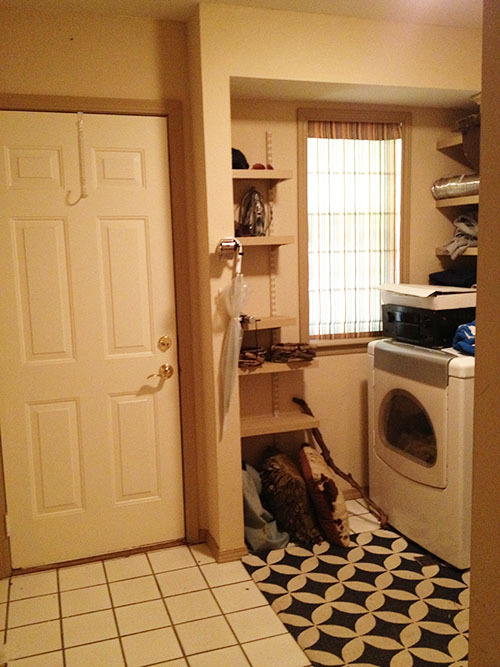 The laundry room has now entered Phase III, slowly but surely. We've installed new lights, hung up my flea market window and started to build a laundry station beneath the window. The husband still needs to reinforce the shelves for the laundry station (more details on that coming in a later post, once it's finished), and we are going to add a place to hang-dry clothes. We also need to find laundry bins to fit the shelves he built, so that's still on our list. Plus we need to replace the gold door knobs and hang more art. Slow and steady wins the race, right? That's what we keep telling ourselves. 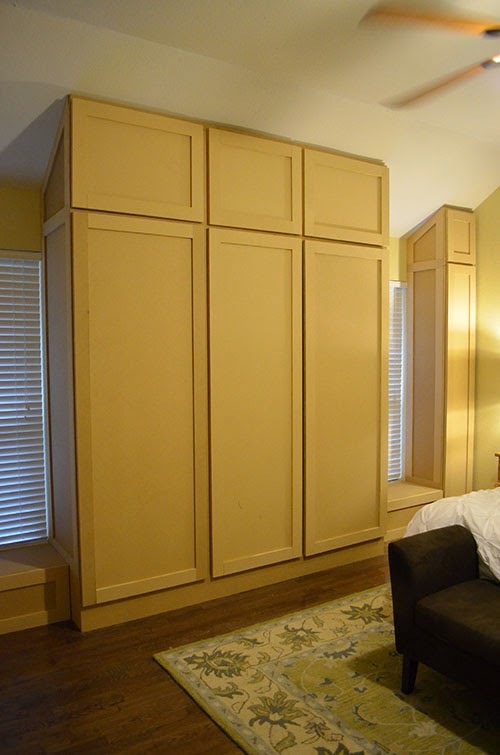 Remember the custom wardrobe closet the husband was building during the summer? It was a beast of a project, and it's still not completely done. This project has involved a lot of complicated carpentry work so far. 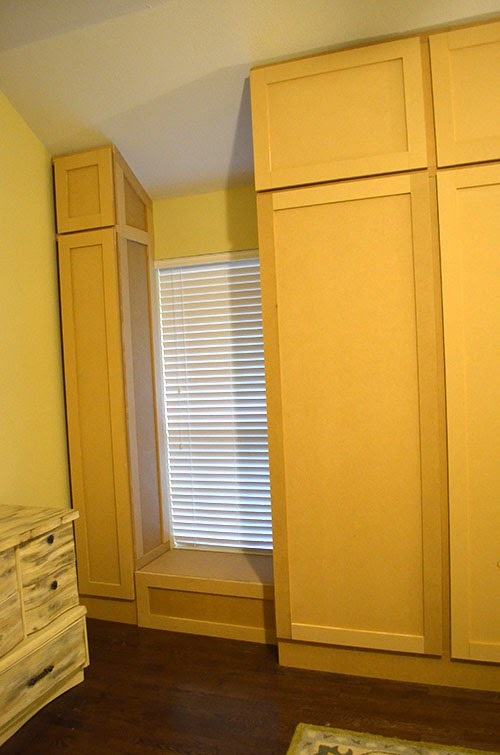 I'm so impressed that my husband with no carpentry training has figured out how to build this closet. He has more patience than I could ever dream of having! The good news is, the closets have been functional for about two months now. They work perfectly for his clothes and have relieved our storage problem. The husband has been working on the finishing touches sporadically over the last month, adding trim to the doors and window seats. See that gap between the wall and the side cabinet in the above photo? That's one of the things that still needs to be finished. He also wanted to add some trim to the bottom of the cabinets to really polish them off. The GREAT news is that our painters are coming soon to paint these cabinets and the entire room, as well as our master bathroom. I can't tell you how ready we are to say goodbye to the yellow walls. I can't wait to see these cabinets painted a fresh white, and I'm excited to add the door hardware we bought a couple weeks ago. Sometimes we get discouraged with how slowly we're moving on these projects, but we all know how life gets busy. 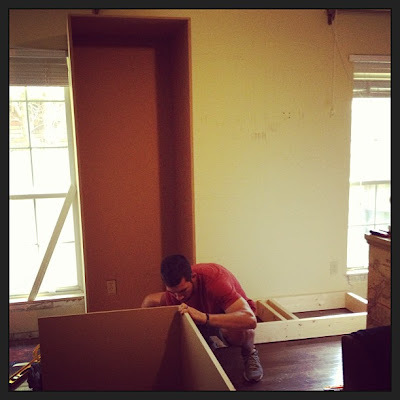 We both work full time and are involved in all sorts of things, so sometimes it's hard to carve out time for projects. It may not be going as quickly as we'd like, but we're still encouraged by the progress we've made so far and excited to keep going. As soon as football season is over and the husband has more time and energy, we're going to pick up the pace again!